For nearly 50 years, Bradley Devitt Haas & Watkins, P.C., has been engaged in creative problem solving for clients facing a variety of legal challenges. Our talented team of Colorado attorneys practices in diverse areas of the law, including family law, personal injury, real estate, construction law, estate planning and business law. We approach each client and case with an open mind, developing customized solutions to meet specific needs. When a client's civil matter involves more than one practice area, coordination among our lawyers is seamless. Based in Golden, Colorado, the law firm solves legal problems for in-state and out-of-state clients living, working, doing business and recreating throughout the region. Our lawyers tackle each new personal injury, family law, real estate or business law challenge with focus and commitment. With a strong knowledge of the law, thorough familiarity with area courts and a drive for excellence, we are prepared to help clients explore all options. 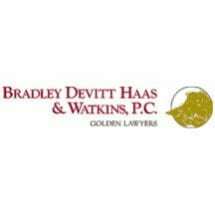 Whether a legal matter involves pursuing insurance proceeds, administrative interactions, negotiations or preparation for trial, Bradley Devitt Haas & Watkins, P.C., has the experience needed to develop promising strategies and make astute judgment calls in pursuit of favorable outcomes for clients. The firm is well-respected in the community and attorneys at the firm maintain an AV Preeminent rating with Martindale-Hubbell. * In the personal injury, real estate and business worlds and in the community at large, the law firm's name is well-known as a source of reliable, trustworthy legal counsel and representation. Withdrew from my case unexpectedly and unprofessionally before court date. I spent A lot of money for nothing. They left me in a bad predicament.